With all of the recent news about Ocarina of Time 3D, Nintendo has updated their fact sheet about Ocarina of Time. It’s nothing that we don’t know except for some little bits it mentions about Visions. Firstly it calls them “Sheikah Stones” instead of Gossip Stones, leaving us to wonder whether these special stones have a different name, a new name, or if that’s just a badly done fact sheet. Also noteworthy is that these “Sheikah Stones”, that glow green when there’s a new vision, are located by Link’s treehouse and in the Temple of Time. Is there only two of them, or should we expect more? I think that two suits, otherwise there’ll be hints all over the place. These two seem like all that are necessary, given that there is one at Link’s childhood “base”, and one at his adulthood base. I’m a tad disappointed that we don’t yet know how the save system is going to work. It should be very “portable” like Pokémon, but if these stones are any indication as to “bases”, it looks like the old save system has been kept in tact. We’ll have to wait and see. Check out the full fact sheet below. The Legend of Zelda: Ocarina of Time 3D brings a completely re-mastered version of this epic entry in the beloved The Legend of Zelda series to the Nintendo 3DS system. The game couples phenomenally enhanced graphics with stunning glasses-free 3D visuals to bring to life the daring adventures of its hero, Link™, in the epic tale of the creation of Hyrule and the struggle for control of its all-powerful ancient relic. A streamlined touch-screen interface and newly implemented motion controls give the game a fresh and intuitive feel. The game will also feature new challenges not included in the original game, as well as a newly implemented hint system to help novice players experience all that the game has to offer. Players who finish the main story can look forward to the Master Quest – a second quest with revamped puzzles and redesigned dungeons that feature the same graphical and interface upgrades as the main game.The Legend of Zelda: Ocarina of Time 3D is a masterful improvement on one of the landmark moments in video gaming history. Dynamic glasses-free 3D visuals and a complete graphical overhaul bring one of gaming’s most beloved and celebrated franchises to life, putting the vivid world of Hyrule in the palm of your hand. The Legend of Zelda: Ocarina of Time 3D retains the analog control of the original via the Circle Pad. Players can use motion control by moving the Nintendo 3DS to aim their slingshot or bow at an enemy with speed and accuracy. This also allows for seamless equipment and item changes with an added touch-based inventory system. Players who finish the main story can look forward to the Master Quest – a second quest with revamped puzzles and redesigned dungeons that feature the same graphical and interface upgrades as the main game. For the first time in a Zelda game, players can access a hint movie if they are stumped on a particular puzzle. 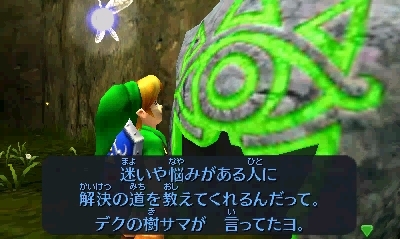 Hint movies can be accessed by visiting the Sheikah Stone, which is located by Link’s house and in the Temple of Time. When a new movie is available, the Sheikah Stone glows green and allows the player to choose from a menu of available movies.